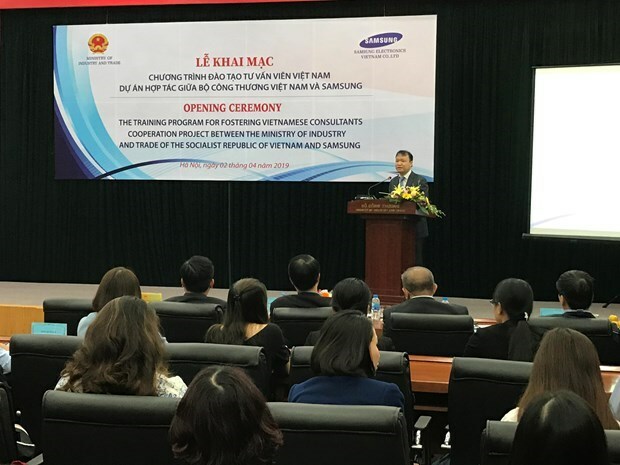 Hanoi (VNA) – Samsung Vietnam, in collaboration with the Ministry of Industry and Trade (MoIT), on April 2 launched a training programme for fostering Vietnamese consultants to improve the production efficiency of local enterprises in 2019, thus gradually meeting the requirements of global supply chains. Speaking at the event, Deputy Minister of Industry and Trade Do Thang Hai said that the training programme 2019 includes four courses, including two in Hanoi and two in Ho Chi Minh City. Compared with those of 2018, each course has one more week of practice, which means that participants are provided with theory on quality control and production management during the first four weeks, followed by nine weeks of practice at enterprises. This year, more than 100 consultants are expected to join the training courses, raising the total beneficiaries to 200 after two years as committed in a memorandum of understanding signed between Samsung Vietnam and the MoIT in March 2018. Sixty outstanding trainees out of the 200 will be sent to the Republic of Korea for advanced training courses. Choi Joo-ho, Samsung Vietnam General Director, showed his hope that after 13 weeks of training, trainees can become pioneers in innovation and renovation at enterprises, thus contributing to the development of Vietnam’s support industry.